Its always great getting thank you's after the fact. If a bride and groom send you one in the mail it really shows that they didn't want to leave you out. Why would you need extra speakers? Always great to get "Thank You's" after the event has wrapped, It really means something special to know you played a role in someone's special day. Who says people don't dance at day weddings?! 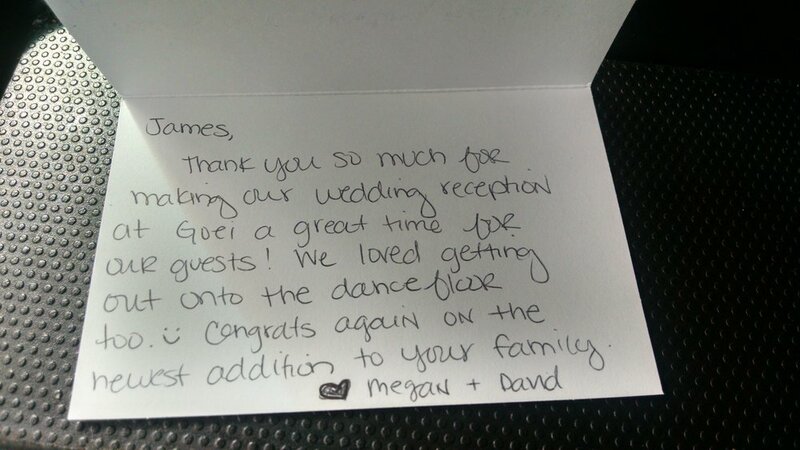 I know how special weddings are, so to receive a thank you from a bride and groom, it really means everything! Thank YOU! Cheers to many more great weddings this summer! I was graciously reminded how nice a hand written letter is to receive in the mail. Today, we send everything via email, or worse, facebook messages. And although still thoughtful, thank you's are much more appreciate when they come hand written, in a pretty little envelope with the formal name on it. A couple days ago I opened up an unexpected letter from a bride that wrote to just say thank you. Her Sunday wedding was many weeks ago, and I am sure she had a billion and one things to wrap up or finish after her wedding, including her honeymoon. But, the fact she took the time to thank me (for doing my job) was so incredibly touching. And, if that wasn't enough, she tipped me. Definitely something that lifted my day, spirits, and pure appreciation for the opportunity to be a part of these special events, and then do a good job at it. So thank you! I wrote you back a hand written letter, but I don't think it compares, and that means more than you can imagine.